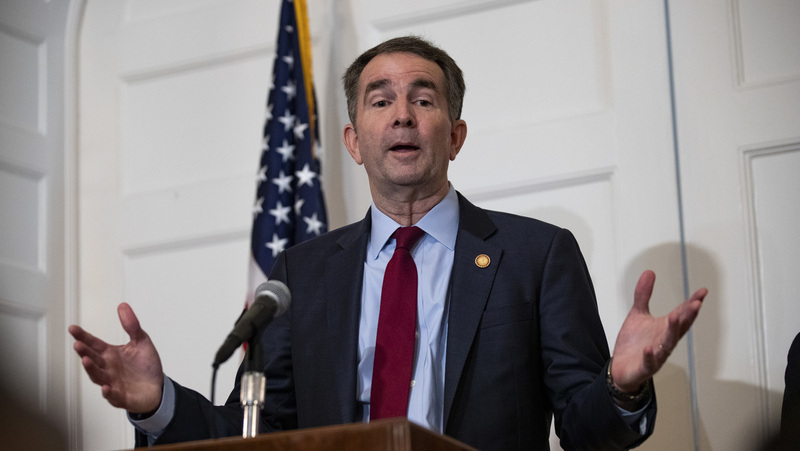 Virginia Governor Ralph Northam Has No Plans To Resign Over Blackface Photograph The Virginia governor's declaration comes roughly a week after the state Capitol was thrown into disarray by the revelation he appeared in blackface decades ago. The declaration comes roughly a week after a racist yearbook photograph sent Virginia's Capitol into disarray and as most state lawmakers decamp Richmond back to their home districts for the weekend. They leave a state capital that remains deeply divided after long, hectic days of loud outrage from critics and nervous silence from allies of the embattled governor. All three embattled politicians are Democrats; the man who would assume the governorship, if they all step down, is GOP House Speaker Kirk Cox. Which leaves their fellow Democratic lawmakers with a question they've found challenging to answer — and one they continue to address with caution: Should the men step down? "Much of the discussion has, rightfully, centered around who we are as Democrats as we continue to stand against racism and against sexual assault. We respect all survivors and believe they should be fully heard," the House Democratic Caucus said in a Friday statement that did not name Gov. Ralph Northam, Lt. Gov. Justin Fairfax or Attorney General Mark Herring. "However, this is not a partisan problem, but a problem for all Virginians and all Americans." Democrats in the state Senate, in a statement released Friday, acknowledged that it must be their actions — not their words — "that will lift up the voices that for far too long have been silenced." Also omitted from this statement were the names Northam, Herring and Fairfax. Several Democrats among the state's national congressional delegation have already specifically called on Northam to resign — issuing a joint statement after Northam's Saturday news conference saying he has inflicted "immense pain and irrevocably broken the trust Virginians must have in their leaders." And nearly every member of Virginia's Democratic House delegation loudly called for Fairfax's departure after the release of the second sexual assault allegation against him Friday. Still, the Virginia GOP didn't hesitate to point out that state lawmakers' recent mild reaction amounted to what the party described as a "hall pass." And its leader noted that while some Democrats initially demanded that Northam resign after the photo surfaced, there was a different response when Herring made his admission. "If this were any other elected position in the Commonwealth, Virginia Democrats would be rightfully calling for a resignation," the Republican Party of Virginia said Friday. "The Democrats have sacrificed their morals and values for political expediency." Later in the day, when a second sexual assault allegation surfaced against Fairfax — this one when he was a student at Duke University in 2000 — Democratic lawmakers came out much more forcefully. Nearly every national congressional representative from Virginia called for Fairfax's resignation in a joint statement.